For use on griddles that have been cooled with three components: holder, polishing pad and screen. 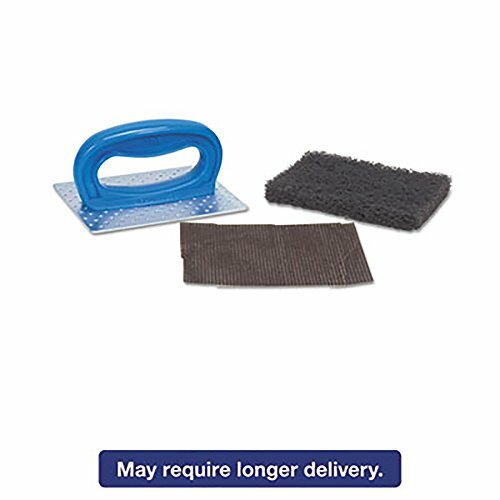 Helps protect hands from grease and burns while providing better cleaning leverage. Loosens carbonized grease and food debris from griddle. Comes with one Scotch-BriteTM Griddle Polishing Pad and Scotch-BriteTM Griddle Screen. Size: 4" x 5 1/4"; Handle Length: 4"; Material(s): Metal/Plastic; Color(s): Blue/Steel. Helps protect hands from grease and burns. Loosens carbonized grease and food debris from griddle. Comes with one Scotch-BriteTM Griddle Polishing Pad and Scotch-BriteTM Griddle Screen.